Here is the world’s simplest foraging toy. Both simple for humans to make, and simple for birds to use, but it is very popular with my parrots. 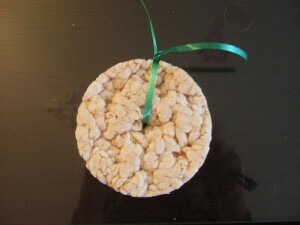 All you do is take a rice cake, poke a hole in it, and thread it with a piece of ribbon or Paulie Rope. Hang in cage, and….et viola! For Pepper, my female eclectus, I hang it somewhere difficult for her to get to, to encourage her to exercise. For Ollie, my male, I put it somewhere more accessible, because he will give up. I don’t know if Pepper actually eats any of it, but boy does she like crunching it. I use brown rice cakes with no added preservatives or salt. I often give the birds one of these in addition to other foraging toys as a little shredding bonus.